Talking about paint thrown at a canvas … a couple of random shapes swimming in space … a bucket, a hammer and a broom entitled “Young Man”, or something like that. I readily concede my ignorance may be the primary factor in the “any chimp” assessment. “If only you could understand the brilliant statement being made!” Alas, I am too simple. 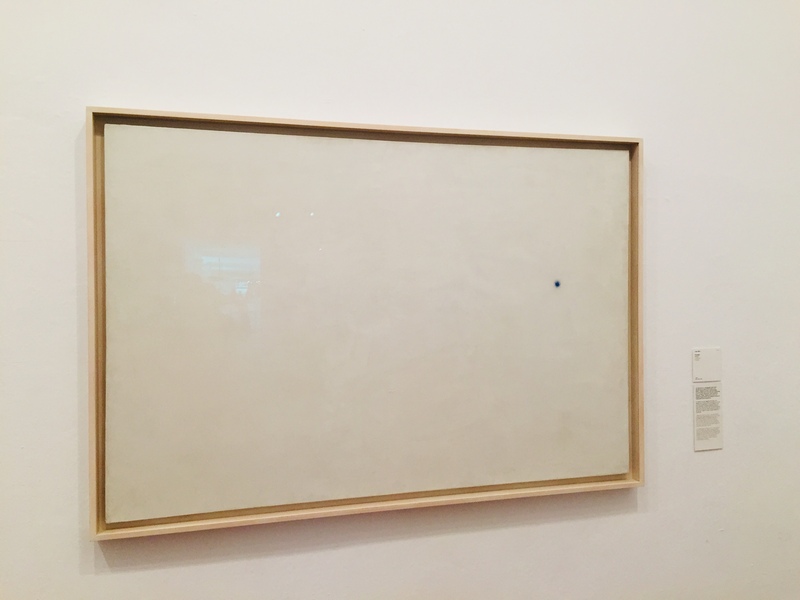 But when a major work of art is, in total, a large white canvas and a small blue dot … shouldn’t a professional be able to do a bit more than that? And there it is, above. It must be brilliant. It is a Miro, painted by Joan Miro, who sweated over this in 1968. Miro is famous, especially here in his hometown of Barcelona, so “Landscape” must be good. But, I would prefer my art to be a bit more, oh, complicated. Or to at least look like it required some effort beyond dabbing a blue spot and announcing you are done. Apparently, and I don’t know if Miro ever said this or his fans came up with the explanation, but the painting above — entitled “Landscape”, acrylic on canvas — has something to do with noise. I like some of Miro’s early stuff, which also can be found in the sprawling museum. Those paintings required a lot, lot more than a single dot. But then he got older and weirder, which happens to a lot of us but particularly artists … and Miro outlined his “oft-quoted interest” in the “assassination of painting”, stemming from his dislike of bourgeois art “which he believed was used as a way to promote propaganda and cultural identity among the wealthy” — as noted on his wiki page. Anyway. 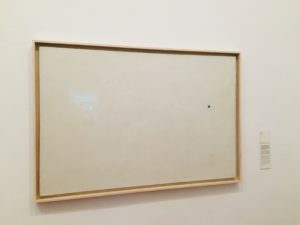 If Miro had been able to make a batch of paintings with a single dot in them … he might have gone a long way personally assassinating painting.